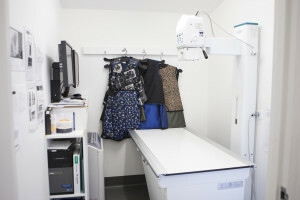 The hospital is equipped with a modern digital radiology suite, which provides immediate high quality images to assist in the diagnosis and management of patients. We also have a separate dental x-ray camera that allows rapid assessment of oral pathology and provides additional capability when trying to image small exotic patients (lizards, mice and budgies). We carry several kinds of radiographic contrast media to provide more specific images of the intestines and bladder when required. Some patients having x-rays will need to be anaesthetised, while others may only require sedation. All patients having x-rays will have a veterinary nurse dedicated to watching and recording their vital signs and ensuring their comfort and safety during the procedure.